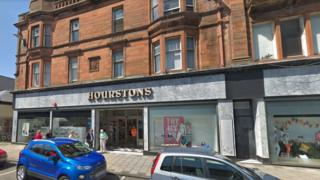 Liquidators have been appointed at the Ayr-based retailer Hourstons. The store, which had been trading since 1896, closed earlier this week with the loss of 81 jobs. At the time, general manager Linda Lawson said the closure of the traditional department store was "merely the reality of retail today". Linda Barr and Eileen Blackburn of French Duncan LLP have been appointed joint liquidators. They have said they will now be selling the store's assets. Ms Blackburn, French Duncan's head of restructuring and debt advisory, said: "Hourstons battled against the changing retail environment but this is a story being told on the high streets of many of our town and city centres as a lot of traditional retailers close because of major consumer changes." She added: "Local councils undoubtedly don't want the destruction of our city centres to occur but don't seem to be acting quickly enough to prevent further closures." Ms Barr said Hourstons had become a victim of changes in the way customers purchased goods. "The high street has become a much more hostile place for many traditional businesses as consumers shift their spending online leaving the centres of our towns and cities with large scale businesses suddenly missing essential customers," she said. "It is extremely difficult to turn around long established businesses once sales start to fall and difficulties emerge. "Hourstons is an iconic brand in Ayrshire and its closure, and the loss of jobs, will be a difficult pill to swallow for the people and community of Ayr." The liquidators said it was not possible to keep the business trading and the premises were unlikely to find alternative retail use. Ms Barr added: "We shall be selling off the assets of the business but, unfortunately, not as a going concern. "The main property is currently being marketed as a development opportunity by CBRE and DM Hall and is unlikely to remain a retail site in the future." South Ayrshire Council said it had "ambitious plans" for Ayr town centre. Council leader Douglas Campbell said: "It's heartbreaking for Ayr town centre to lose Hourstons - which has been an institution on our high street for more than 100 years, diligently serving people during good times and bad. "Hourstons was synonymous with Ayr high street and its loss will be felt throughout South Ayrshire and beyond." The council's employability and skills team will be available for those losing work as a result of the Hourstons closure. "We remain committed to delivering on our ambitious plans to transform Ayr town centre," Mr Campbell added, "and make sure it offers a healthy mix of social, cultural and economic opportunities for local people and visitors. "This is why we're investing more than £50m in new and improved facilities which include a new leisure facility as well other projects to encourage people into the town centre to take full advantage of what's on offer."